Recipe: Paleo Coconut Popsicles. Perfect for Summer. 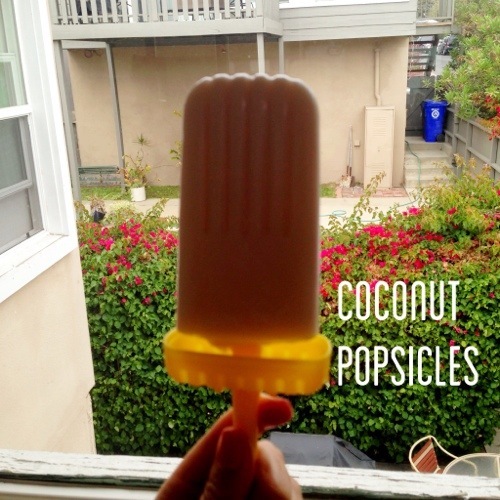 A couple weeks ago I came across a delicious recipe for coconut popsicles. It’s made with coconut milk and is gluten-free, paleo, and completely friendly to anyone who is on a sugar detox diet. It looked really yummy and since summer is in full swing, I decided to buy myself a popsicle mold and get to work. I posted a picture of them on Instagram and they got a rave response so I decided to post the recipe. Enjoy! Popsicle / Ice Pop Mold. This is the one I use..
First, figure out how many ounces are in your popsicle molds. Your can of coconut milk will likely not be enough so supplement the rest with water. For example, my molds were around 3ounces for each popsicle (6 total). That’s 18 ounces. The can of coconut milk was only 12 ounces so I added a half can (6 ozs) of water. Mind you, I did this all by guesstimation so if you are a more precise measurer I am sure you can figure out a better way to do this. Once you mix your water with the coconut milk, add 1 tsp of vanilla extract. You can put a little more or less depending on how strong you want the flavor. Pour the mixture into the molds and freeze overnight. If you want to add more fruit to them, you can. I was thinking bananas or mango might be fun to try the next time around. If you are looking for something super sweet these are not for you but they are an amazing summer treat if you are on trying to kick your sugar cravings and enjoy a healthy and satisfying treat. Note: When these popsicles came out of my freezer they were super hard to get out of the mold so I ran it under hot water for about a minute or so to loosen the coconut popsicle up and take it out of the mold. Note #2: The first time I made these I poured too much mixture into the mold and when I went to slide the popsicles out of the mold, they didn’t even stick to the stick. Eeek. Don’t let that happen to you. Note #3: These are a treat best enjoyed with good friends, family, and loved ones on a nice summer day. 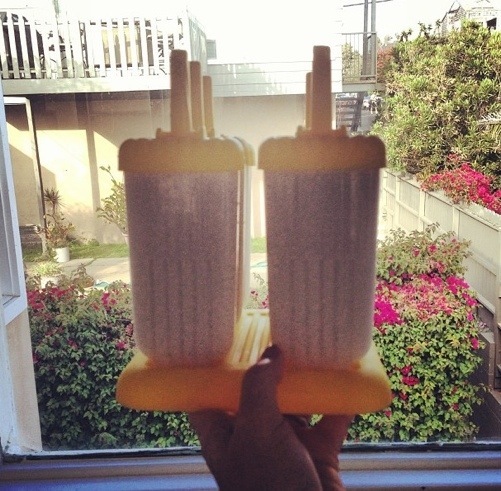 I am so stoked on my new popsicle mold and this recipe. Hope you enjoy as much as I did! If you are looking for more coconut awesomeness, check out my list of All Things Coconut.